BSJ | What Foreign Policy? Being President of the United States of America is not a simple task. There are a plethora of different roles to be filled, from the responsibility of leading the most powerful nation in the world to the small problem of trying to convince the majority of a very large, and divided, population to vote for you in four years’ time. The President and Vice-President are the only nationally elected positions in the US and this is one of the reasons why the President has far greater freedom in foreign policy than domestically. The President is Head of State, Commander in Chief and has the power to sign treaties and appoint ambassadors. 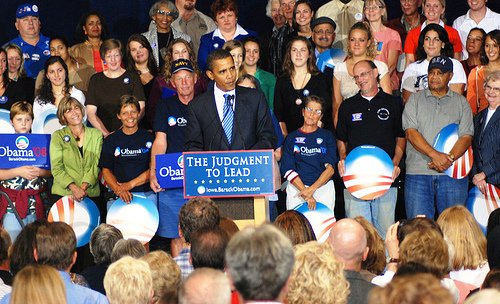 In 2008 Obama campaigned on foreign policy issues such as the withdrawal of troops from Iraq, closing Guantanamo Bay and attempting to find a solution to the Arab-Israeli conflict. As Governor Romney has pointed out, Obama has had four years to act. Has his first term been a success? Michael Hirsh suggested that “the real Obama doctrine is to have no doctrine at all. And that’s the way it’s likely to remain.” He intended that as a compliment but it is a viewpoint which is open to interpretation. John Mearsheimer, the respected political scientist, suggested that it is the insistence of US presidents to adopt a grand strategy during the Cold War era which led to many of the foreign policy issues faced today; Afghanistan almost seems like a too obvious example to use. The alternative view is that the lack of any coherence or structure to the Obama foreign policy has led to an embarrassing lack of response to events in the Middle East, a lack of progress (a subjective term I use intentionally) with China and Russia and a policy towards Afghanistan which is neither a break with the Bush operation or a plan strong enough to stabilise the failed state. It may be excessively harsh to claim that Obama has had no strategy at all yet it is impossible to overlook the fact that, when compared to his two predecessors, Obama has often been slow to act and has frequently followed a pragmatic approach to foreign policy issues. If one were to find a ‘strategy’ in Obama’s foreign policy it would be one of multilateralism with a greater emphasis on trade and cooperation. Obama has had to face the fact that America could not sustain the type of interventionist policy of George W. Bush, as a result of harder economic conditions as well as the difficulties of fighting such campaigns. During the campaign in Libya, Obama tried to push for a NATO which was not as driven by the United States but quickly had to accommodate the fact that US military strength is unrivalled. The US spends more on defence than the next 15 nations and the capabilities and technology of the US armed forces ensured a certain level of involvement. Foreign policy is also an area in which it is difficult for Obama to initiate policy. He has only been able to operate with the circumstances and events provided. He was fortunate in the finding and successful assassination of Osama Bin Laden but he also had to deal with Benjamin Netanyahu making any development in the peace process impossible. Furthermore, Obama’s multilateralist inclinations are always going to be limited by institutions such as the UN Security Council. The main criticism of Obama from the Republican camp is that he has failed to project a strong image of America abroad and that he has failed to take decisive leadership where necessary. His decision to delay withdrawal of troops from Afghanistan until 2014 (though one shared by the Republicans) does show a lack of conviction, as does his stance on the Iranian nuclear policy. Tehran is aware that Obama will not use military force against Iran and thus the trade sanctions are of little concern to a country with little concern for its population. Obama has, however, been willing to continue the contentious issue of drone strikes and has done so effectively. His counter-terrorism programme has been successful in taking out the main leadership of al-Qaeda. Obama is also right to reject calls for a tougher stance on China. Romney may want to accuse China of currency manipulation from day one but as Obama pointed out, it is not wise to insult your banker. The foreign policy of the past four years is best described as a cautious and pragmatic approach which has had limited success. Afghanistan is unlikely to end in anything other than civil war but the responsibility for that should not fall on Obama. It should be expected that Obama will take a more active role in foreign policy should he be elected for a second term, even more so if he faces an unworkable House of Representatives once again. His failure to live up to his campaign promises should not be criticised too harshly as many factors, such as the current Israeli leadership, made certain actions impossible. Obama’s lack of active foreign policy has ensured a lack of any disastrous policies. If Romney were to live up to his campaign promises it would not be likely to end in the same way.